Autologous Chondrocyte Implantation (ACI) - DOCJOINTS//DR SUJIT JOS//Total joint replacements with the best quality care at affordable price options at kochi, Ernakulam, Kerala, India / Knee, hip, shoulder, ankle, elbow replacement, Sports Medicine – Keyhole / Arthroscopy for Sports Injuries / cartilage preservation and cartilage regeneration techniques / minimally invasive subvastus / rotator cuff repair, biceps tenodesis, subscapularis repair, shoulder dislocation, bankart, Latarjet / Dr Sujith Jose is a renowned Orthopedic surgeon with vast experience in Joint replacement and satisfied patients from all around the world. Economical / budget knee done as special package price/ cartilage restoration, OATS, Ankle arthroscopy/ acl pcl mpfl meniscus repair/ wrist arthroscopy tennis elbow/ modular imported high quality operation theatre – Johnson & Johnson theatre with double lamina flow – The best care for your joint problems! What is Autologous Chondrocyte Implantation (ACI)? 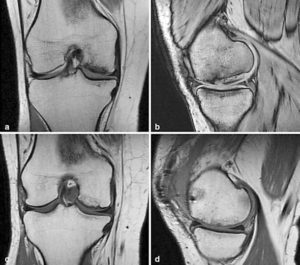 Autologous Chondrocyte Implantation (ACI) is a surgical procedure for the treatment of full thickness cartilage defects in the knee. ACI is a two part surgical procedure. The first surgical procedure is an arthroscopic procedure during which a thorough evaluation of the joint is made and a biopsy of cartilage is taken. This biopsy is then sent to Genzyme to be cultured and grown to a large volume of cells. The second surgical procedure is an open procedure during which the cultured cells are re-implanted into the areas of damage within the joint. Who is a candidate for ACI? ACI is designed for the treatment of isolated cartilage defects in symptomatic young active patients. 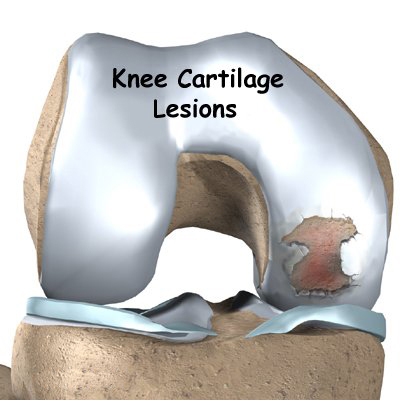 These isolated cartilage defects are often referred to as potholes as they tend to resemble potholes in a street. ACI is designed to return patients to pain free activities of daily living such as walking, stair climbing, and cycling. ACI is not designed to return patients to high level sports competition such as long distance running and competitive team sports. Patients who have experienced joint space narrowing on xray or who have been told they have “bone on bone” osteoarthritis would not be a candidate for ACI. What can I expect from my surgical arthroscopy? arthroscopy for 2-3 days. You will be permitted to put full body weight on your leg immediately following surgery but it is a good idea to use crutches to help support you as you will be somewhat sore in the first few days following this procedure. When you return to the office for your post operative appointment you will meet with your surgeon and his physician assistant to discuss the findings of your arthroscopy. What will happen during my Autologous Chondrocyte Implantation? The second step of your surgical management is the Autologous Chondrocyte Implantation. This procedure is done as an open procedure which means that you will have a larger incision which will measure anywhere between 3-6 inches in length. During this step in your surgical management your surgeon will open your joint through an incision to locate the areas of damage. Once these areas have been located they will be debrided or cleaned out in preparation for the implantation of your new cells. Once the areas of damage have been cleaned and are ready to accept the new cells, your surgeon will draw the cells into a syringe. These cells are then carefully placed into your defects or “potholes”. The Cultured hyaline cartilage cells will be mixed with fibrin glue in a Duplojet syringe and injected into the “pothole” of cartilage defect. The mixture will set in defect in 8 – 10 minutes time, after which the knee is moved through a full range of motion to ensure smoothness of the cartilage implant. Once all of the “potholes” have been treated your incision will then be closed using subcutaneous suture also known as “dissolvable stitches”. Depending on the number of “potholes” and their size within your joint this surgical procedure will take between one and three hours. This procedure will be done using either general anesthesia or epidural anesthesia depending on your and your surgeon’s preference. What can you expect post-operatively after ACI? When you awake from surgery you will have a brace on your leg that will keep your leg straight. It will be important for you to wear this brace at all times when you are up and about. You will also be given crutches. Depending on where in your joint the “potholes” are will affect how much pressure you can put on your foot while walking with your crutches. The majority of “potholes” require you to be touch down weight bearing (the weight of your leg to the ground) only. This restriction will be in place anywhere from 6-10 weeks. Depending on the complexity of your procedure you may be required to remain in the hospital between one and three nights. The length of your inpatient stay will be discussed prior to your surgical intervention and re-evaluated each day of your inpatient stay. Your discharge from the hospital is based largely on your pain level. It is important to make sure that your pain is well controlled prior to leaving the hospital. Most patients are discharged to their homes with in home services. These services include a visiting nurse who will check your incisions and manage your wound care as well as an in home physical therapist. You will likely participate in home physical therapy for a period of approximately 3 weeks prior to transitioning to outpatient physical therapy. Your surgeon will provide you with prescriptions as well as detailed protocols for physical therapy that are tailored to your specific surgical intervention. How will my pain be controlled after surgery? Immediately following surgery during your inpatient stay your pain will be controlled using IV pain medication. During your inpatient stay one of the goals of your care will be to transition you from IV pain medication to oral pain medication. This is often achieved by day one or two after surgery. You will be sent home from the hospitalwith a prescription for oral pain medication to be filled at your local pharmacy. The most commonly prescribed post-op pain medications include Oxycodone, Dilaudid, or Vicodin. Most patients will require regularly scheduled doses of pain medication (every 4-6 hours) for the first two to three weeks. Following week three you will begin to decrease your pain medication use to prior to physical therapy and prior to bedtime. Most patients will not require any pain medication past week 10 to 12. You will be provided with detailed instructions on how to obtain pain medication refills from your surgeon’s office. This information will be provided to you with your surgical packet once a surgical date has been scheduled. It is important to know how to obtain your pain medication refills appropriately and in a timely manner. When will I follow-up with my surgeon after surgery? Your first post-operative visit will be with your surgeon’s Physician Assistant. This appointment will take place 2 to 3 weeks after your surgery. This appointment is critical for checking your incision healing and range of motion as well as to answer any questions you may have in the first few weeks following surgery. You will then followup with your surgeon 6 weeks after surgery, 12 weeks after surgery, 6 months after surgery, and one year after surgery. At one year post-op you will discuss with your surgeon your return to higher level activity. After your first year you will follow with your surgeon on a yearly basis. How long will I have to wait between my arthroscopy and my ACI? This is slightly different for each patient. It depends largely on your insurance approval and your surgeon’s schedule. On average most patients are required to wait between 3-4 months. How long will my biopsy last? 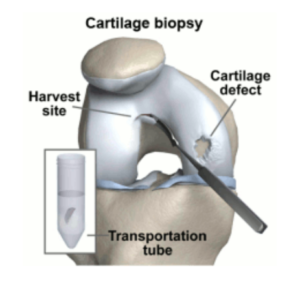 Your cartilage biopsy can be held at Regrow (Chondron) for up to 2 years time. How do I get insurance approval for surgery? Your insurance approval will be handled by your surgeon’s administrative assistant. Often you do not need to do anything but wait for the administrative assistant to contact you to let you know you have been approved. In some instances appeals need to be made to your insurance company for denial of services, if this is the case the administrative assistant will contact you and instruct you on how to proceed. How long is my insurance approval good for? Most insurance approvals are good for one calendar year from the date of approval. You will start physical therapy beginning the day after surgery in the hospital this will be continued once you are discharged. What will I do during physical therapy? Each defect area has a specific physical therapy protocol. You will be provided with these protocols after your surgical intervention. Your physical therapist will instruct you on each exercise. When do I need to wear my brace? You will need to wear your brace anytime you are up moving around on your crutches. You will use your brace for 6-10 weeks on average. You do not need to wear your brace for sleeping or when you are sitting. How long will I need to use my crutches? Depending on the extent of your surgery you will need to use your crutches between 6 and 10 weeks on average. For patients undergoing right leg surgical intervention you may not return to driving until you have discontinued using your crutches (approx. 6-10 weeks). For patients undergoing left knee surgery who do not drive standard transmission vehicles you may return to driving between 3 and 6 weeks when you are no longer taking pain medication. You may shower 5 days after surgery but may not submerge your incision in a pool, hot tub, bathtub, lake or the ocean for 3 weeks. This will be different for each patient and depends largely on the extent of your surgery as well as the type of work you do. Most patients who work in a sedentary position or desk work will be back to work by 6 weeks. Those patients who work in more labor intensive jobs may be out of work for up to 12 weeks. When can I resume my regular activity? Return to regular activity depends highly on each individual patient’s definition of regular activity. Non impact activity such as walking, swimming, bike riding, and elliptical trainer can all be resumed by 4-5 months. Higher demand activity such as running and sports will not be able to be resumed until atleast 1 year post operatively. How long will it take me to recover from the arthroscopy? Most patients have their arthroscopy on a Friday and are back to regular activity by Monday or Tuesday. How long will it take me to recovery from my ACI? Each patient is different and depending on the complexity of your surgery your recovery time may differ. However, on average most patients feel a sense of improvement in the surgical joint by approximately 3-4 months. You will work to regain your muscle strength over the entire year following your surgery. You may be required to spend 1-3 nights in the hospital. This will depend largely on the complexity of your procedure and any other associated procedures that are performed at the time of your ACI. I don’t like how narcotic pain medication makes me feel, can I take something else? What happens if I don’t use my cells? If your cells are not used within the two years following the date of biopsy they will bediscarded by Chondron. If you would like to have your cells held longer for possible use in the future you can pay a fee to Chondron for additional storage time. Who do I call if I have a question prior to my appointment? If you have questions regarding your upcoming surgery you may call your surgeon’s physician assistant.